The annual MJBizCon that began Wednesday is again setting record numbers for attendance and exhibitors, mirroring the marijuana industry’s explosive growth and its bullish prospects after voters approved three new cannabis markets worth up to $2 billion. Roughly 25,000 marijuana industry professionals, investors and entrepreneurs are expected to attend the three-day conference at the Las Vegas Convention Center. That’s up from around 18,000 in 2017. An analysis of trends and the latest industry data underscoring the cannabis industry’s rapid growth. How to prepare your business for large corporate competition as the marijuana market matures. The future of fundraising in the marijuana industry and the latest capital market trends. The present and future of science and research in the global cannabis industry. Top strategies for navigating regulatory hurdles as you take your firm public. The conference, hosted by Marijuana Business Daily, is now in its seventh year. The 2018 iteration of MJBizCon features 150-plus speakers, more than 65 sessions and over 1,000 exhibitors. The exhibitors are spread out over nearly 175,000 net square feet of floor space, up 137% from last year. 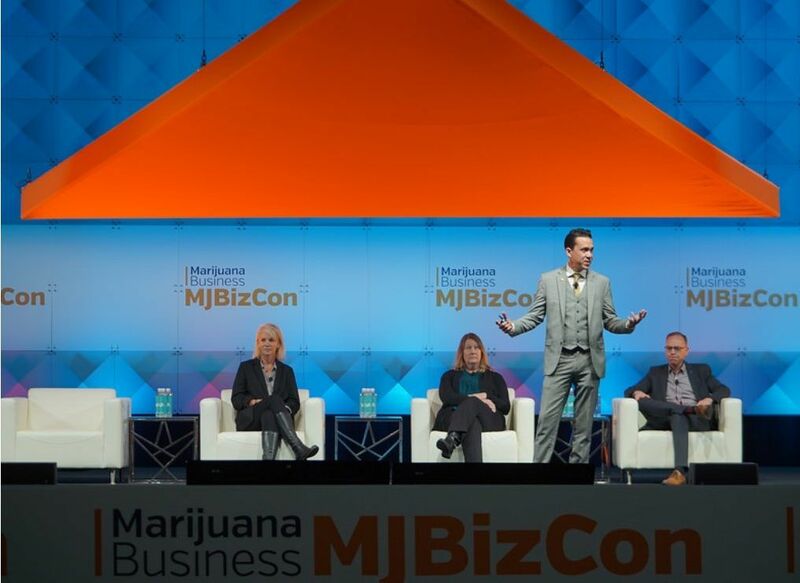 “Once again, the team at MJBizDaily has created an all-new conference program, chock full of the hands-on operators in the industry who are innovating, creating new best practices and tackling the emerging business challenges,” said Cassandra Farrington, CEO and co-founder of Marijuana Business Daily. The gathering comes on the heels of last Tuesday’s midterm election, where marijuana scored big at the ballot box. Voters approved new markets in Michigan, Missouri and Utah that eventually could generate $2 billion in medical and recreational sales. Every sector of the industry, meanwhile, is represented at this year’s MJBizCon, including retailers, cultivators, financial services, infused product manufacturers and testing labs. Attendees are expected from all 50 U.S. states as well as representatives from more than 60 countries, including China, Israel, the United Kingdom, Colombia, Australia and the Central African Republic. Chris Walsh, founding editor and vice president of Marijuana Business Daily. Torsten Kuenzlen, CEO of Sundial Growers who previously held key posts at Coca-Cola and Molson Coors. Codie Sanchez, a partner at early stage investment funds CS Ventures and Magma Partners. Kevin Murphy, founder and CEO of Acreage Holdings, a multistate U.S. cannabis company. Chris Hagedorn, general manager of Scotts Miracle-Gro unit Hawthorne Gardening. MJBizCon also features a luncheon for minorities in cannabis and a women’s networking reception. On Tuesday, an institutional investor session was held for for the first time through MJBizCon, occurring one day before the start of the full-fledged conference. Possibly the worst on site registration system for paid attendees of any conference I’ve attended. For the amount the conference charges, registration should be fast and painless. Instead, lineups are at least an hour with seemingly no on site coordination. Horrible conference management. uh hello? there is no conference without Canada. We are the worldwide leaders and trailblazers of the mighty Cannabis plant. No mention of any Canadians in this art. or of any Canadians attending the conference, probably cause they got turned away at the border, cause Americans and their doctors still dont know that there is an endocannabinoid system in the body that interacts and responds to the cannabinoids in the Cannabis plant, the active components work together to help achieve health and homeostasis in the bod, but it is gunna take those people awhile to figure that one out! I predict 5 or so more years! oh! and please stop using the term marijuana, it is so antiquated and doesnt bide well with peeps who know nothing about the plant, just begin to phase out the derogatory term, which is a mexican street name for the herb, and use the term Cannabis instead okay? Thanks! Okay so that is your lesson for today.